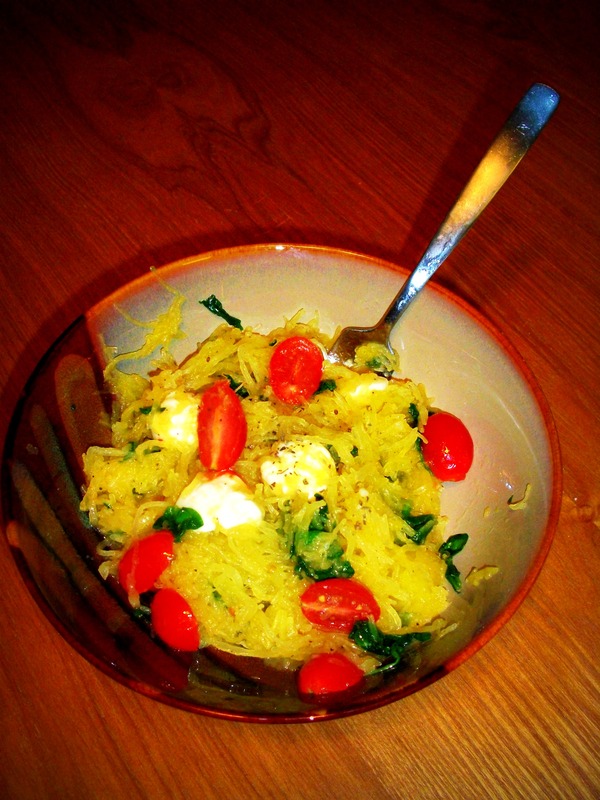 A recent Pinterest find had me all sorts of curious about spaghetti squash. Not that I hadn’t heard of it before, I’d just never eaten it, let alone prepared it myself. I had no clue it would be so delicious, easy to prepare and nearly as satisfying as the real deal. 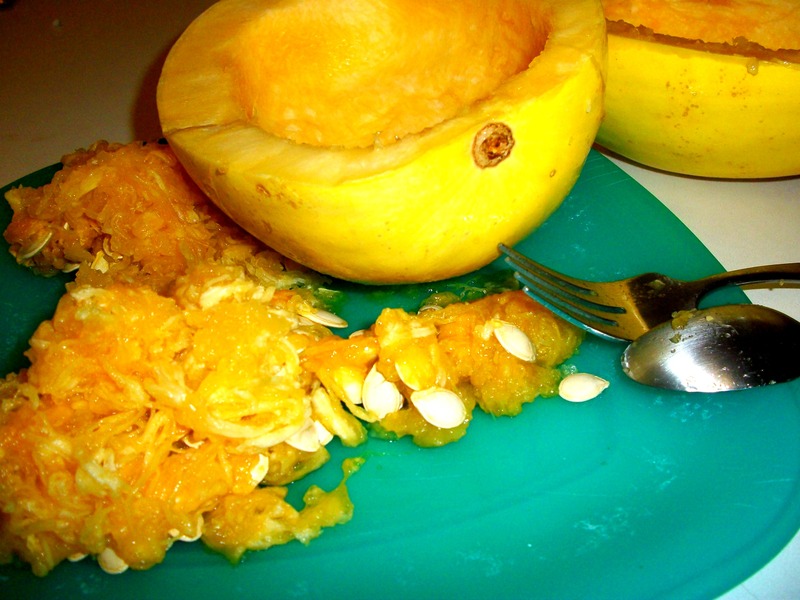 I tossed it into the microwave, rind up, for about 8 minutes. At this point I thought I had removed all of the “good stuff” and that there would be nothing left to eat. Boy, was I wrong! 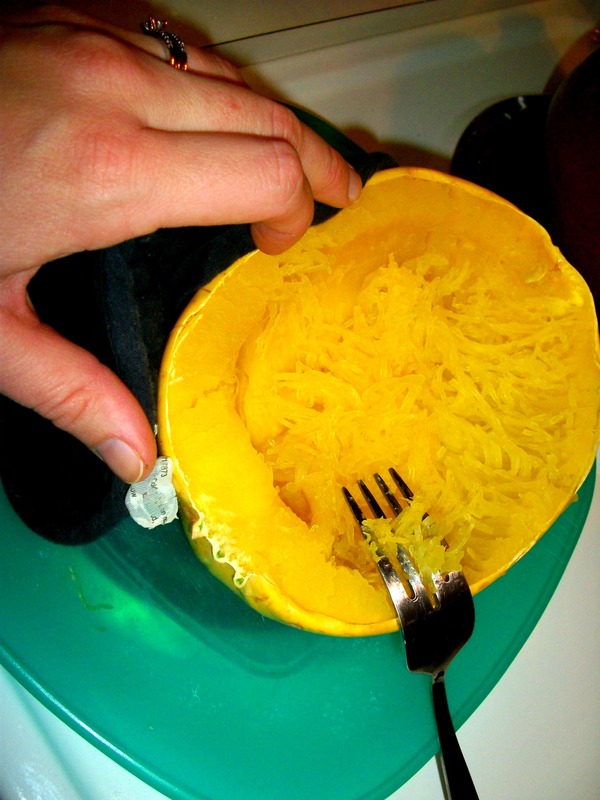 I took the squash out of the microwave and couldn’t wait to see what I had. (Hence, the oven mitt below…it was so hot!) Sure enough, the inside was all spaghetti-ish and as soon as I started scraping it with a fork, tons and tons of spaghetti strands were created! I only cooked one half and it make more than enough “spaghetti” for my meal. I suppose I should mention the other major player in this meal. 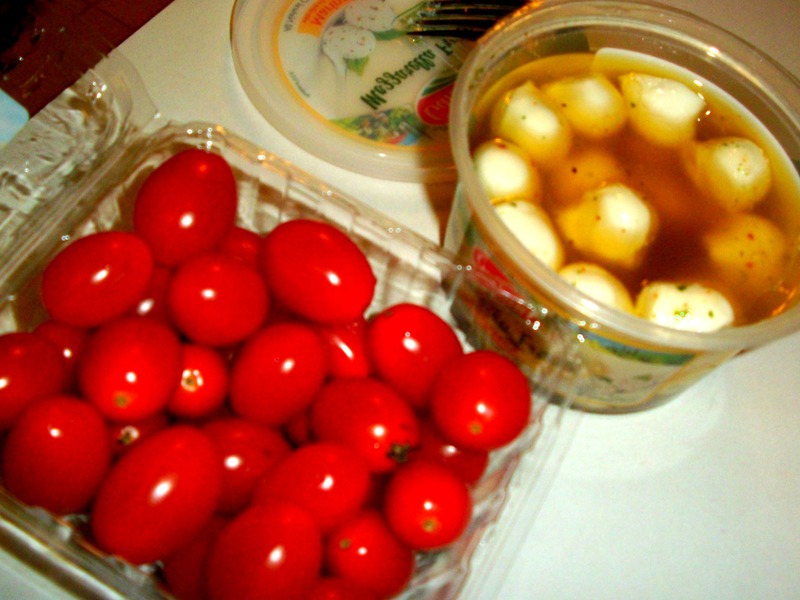 These AMAZING marinated mozzarella balls. Seriously, I could’ve made a meal out of these things! Can’t forget the grape tomatoes! 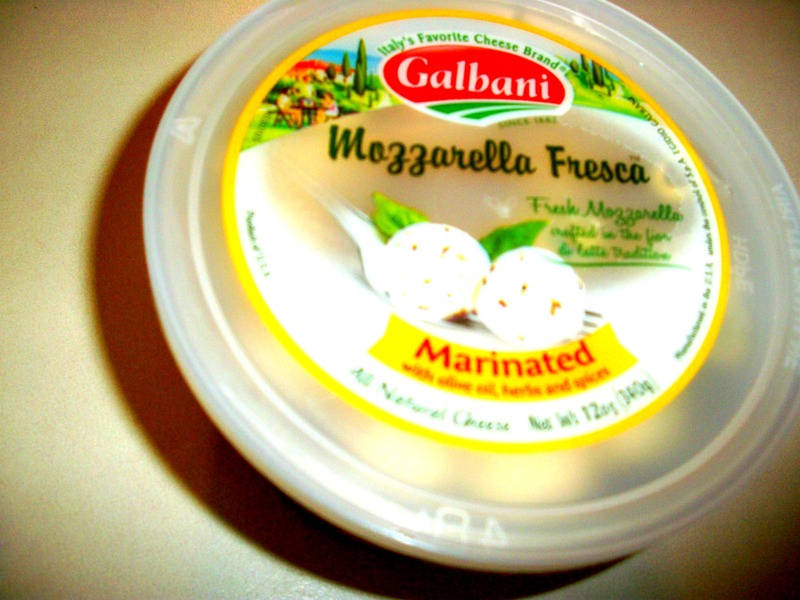 Oooh, and you get a view of the yummy mozzarella marinade in that pic! 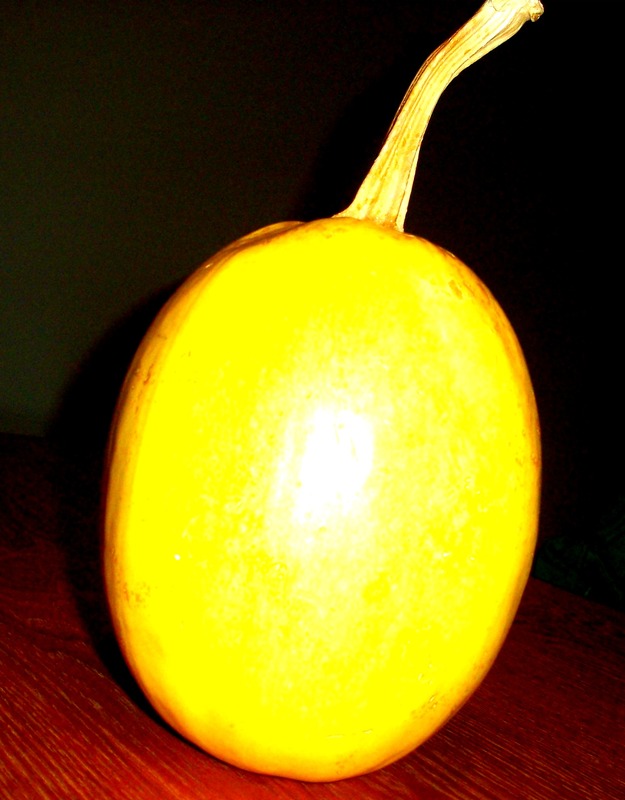 I used that olive oil marinade to wilt some spinach while my squash was in the microwave. 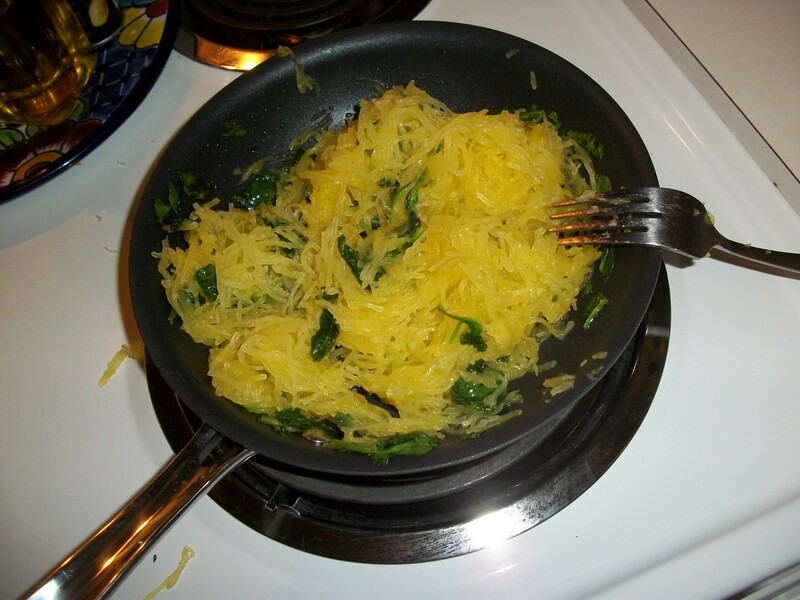 Once my squash was all “spaghettied”, I tossed it in the pan with the spinach. I added a few sliced tomatoes and mozzarella balls. I also sprinkled it with salt and pepper and a few more drizzles of the mozzarella marinade. Obviously fresh basil would’ve fit into this dish perfectly, but I didn’t have it so I sprinkled a little dried basil to at least give it a bit of the flavor. Next Post I need a to-do list.